Implementation of a Pretrial Diversion Program for Potter County. Continued partnership with the National Data-Driven Justice Initiative. Expanded early education programs to identify and address the rise in juvenile anti-social behavior/mental health and criminal activity. Transitional/half-way housing for offenders along with an increased focus on skills training and employment needs. Training on understanding, cooperation and communication among all the criminal justice agencies and offices in the county. To reduce the number of criminals who re-offend (recidivism), the board has identified the following gaps: need for more vocational training; enhancing and creating more youth services; lack of family support services; need for data collection; need for more correctional alternatives; lack of service system addressing behavioral health issues, lack of support from the community and funding. To address these issues, the board has proposed: addressing the stigma; educating employers; developing a community center; an increase in Children & Youth Services involvement; community ownership; enhancing efforts to prepare inmates for re-entering society; providing education for offenders and their families; providing behavioral health treatment; enhancing mentoring programs; working with different age groups; and pursuing alternative sentencing options. For alcohol and drug abuse-related crimes, the board has identified the following gaps: lack of education; lack of disposal of old medication; lack of drug-related education for licensed doctors; lack of communication between doctors and pharmacists; lack of doctor accountability; identity theft for acquisition of drugs; and a lack of general data. To address these issues, the board has proposed the following strategies: pursuing goals of the National Data-Driven Justice Initiative; continuing Medication Take-Back Days and Collection Boxes; enhancing communication between the criminal justice system and the physical health/behavioral health fields; continuing doctor education; and increasing alcohol, tobacco and other drugs education through evidenced-based programs within the school districts. For mental health-related crimes, the board has identified the following gaps: lack of training for personnel; a gap between Substance Abuse and Mental Health programs; lack of funding; lack of available treatment; and lack of county in-patient facilities. To address these issues, the board has proposed: training for probation officers, jail personnel, and others; secure funding for alternatives; examine resources and how they are used in the system; examine the creation of a Mental Health Court, increasing co-occurring (mental health/drug abuse) options. 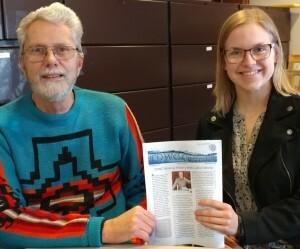 Charlie Tuttle (right) from the Potter County Planning/GIS Department is the new chair of the Triple Divide Watershed Coalition, succeeding John McLaughlin. They’re shown with a copy of the new TDWC Currents, the organization’s newsletter. Copies are available by calling 814-274-8254. New regulations drafted to protect public drinking water sources have been implemented by Potter County officials, according to information reported at this month’s Triple Divide Watershed Coalition meeting. The rules incorporated in the Potter County Subdivision and Land Development Ordinance require anyone who is planning a land development within a designated water recharge zone to notify system operators and gain their consent. Also at this month’s meeting, Potter County Planning Director Will Hunt reported that he has conferred with the U.S. Geological Survey on the groundwater mapping project planned in Potter County later this year. Due to limited funding, USGS will scale down the number of water wells to be analyzed and adjusted its sampling matrix. There now will be about 50 wells tested to create a profile of the county’s groundwater resources. Sampling should begin this summer. TDWC members also reviewed proposals from companies interested in providing 24/7 monitors on the 16 wells, springs and surface sources used by public water suppliers in Potter County. Campbell Scientific was selected from among three bidders, pending a meeting with company representatives to clarify specifics. elected Charlie Tuttle of the Potter County Planning/GIS as chair, succeeding John McLaughlin. introduced the new newsletter, TDWC Currents, designed to keep members up to date in developments with the coalition and related topics. welcomed Mark Accettulla, sanitarian with the Pa. Dept. of Environmental Protection. Accettulla’s region consists of Potter and Tioga counties. reviewed a water system contact spreadsheet created by Jim Clark, water specialist/educator with Penn State Extension. heard from McLaughlin and Hunt that a mapping project to inventory public water system infrastructure is expected to begin this summer. Attending were John McLaughlin, Jim Clark, Will Hunt, Charlie Tuttle, Mark Accettulla, Darrell Davis and Dale Steadman (Genesee Water), Commissioners Doug Morley and Paul Heimel, Gareth Gockley (Coudersport Water), Tony Adami (Galeton Water), Danielle Roslevich from Pa. Rural Water Assn., Tina Bennett (Gaines Township Water), Bev Morris (Coudersport Borough), Jason Childs and Jared Dickerson from Potter County Conservation District, and Fern Burdick (Northern Tier Children’s Home).